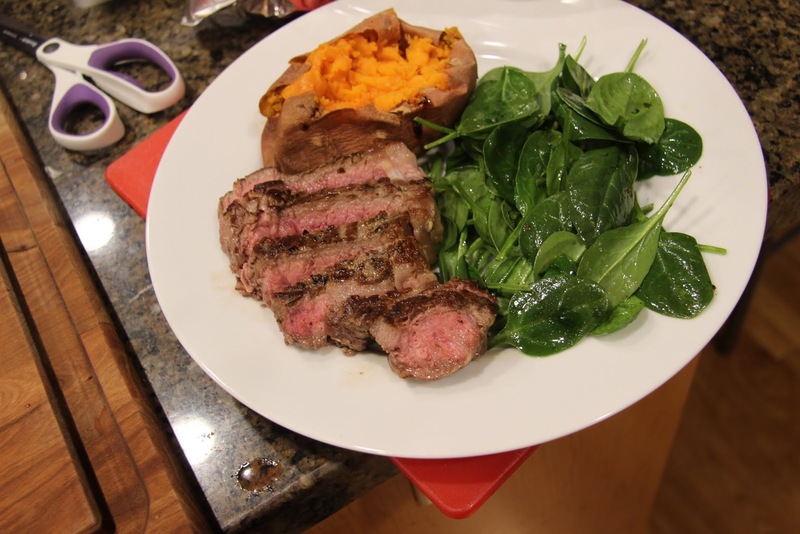 Oh, this New York strip steak was a treat! I swear to you if you buy good quality meat and know how to prepare it (I’m gonna show you) you can have a fine steakhouse quality meal at home. For like, way less than a quarter of the price, especially when you add in sides and drinks. My girls’ minds were blown when I tallied up how much our meal may have cost in a restaurant. It was a good lesson because we do like to take them out to nice places on occasion and I like for them to have an understanding of the cost of that experience to give them a little perspective. And, of course, a little damn appreciation. I buy most of my meat from Costco because I’m always happy with the quality. 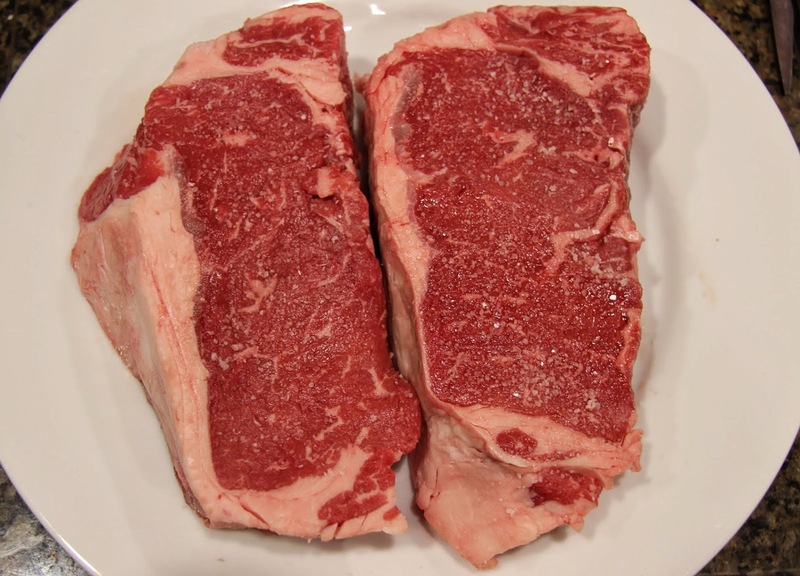 These choice-grade New York strips were just $8.99 per pound. As you know, you’re going to pay up to four times that much, maybe even more, at a steakhouse. And yes, the quality might be slightly better as they generally serve prime grade beef but Bob and I would not have been able to tell the difference and we’ve eaten plenty of high-end steaks. If you want, you can also often find prime grade New Yorks at Costco for around $16 per pound but it’s not worth twice the price for me. Before you get started, here are a few things I think are key in ensuring a properly cooked steak. The first is don’t ever throw a refrigerated steak immediately into a hot pan. 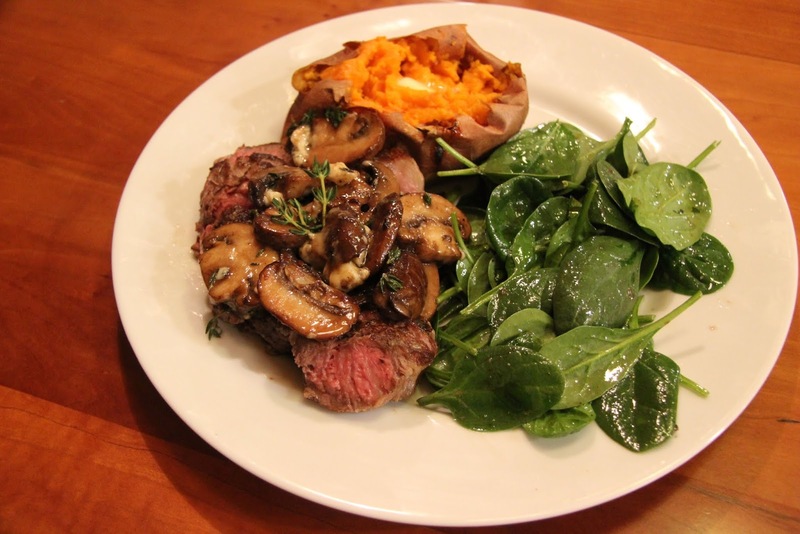 Take the steak out of the fridge and, depending on its thickness, set it out at room temperature for 30 – 45 minutes. These steaks were almost 2 inches thick so I left them out for about 45 minutes. 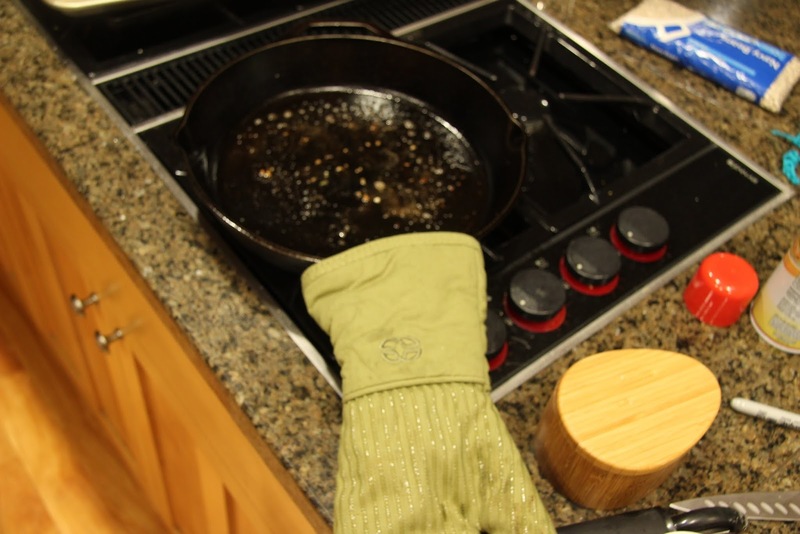 The second is a preheated cast iron pan that will ensure a good sear, even cooking, and can go from stove to oven. 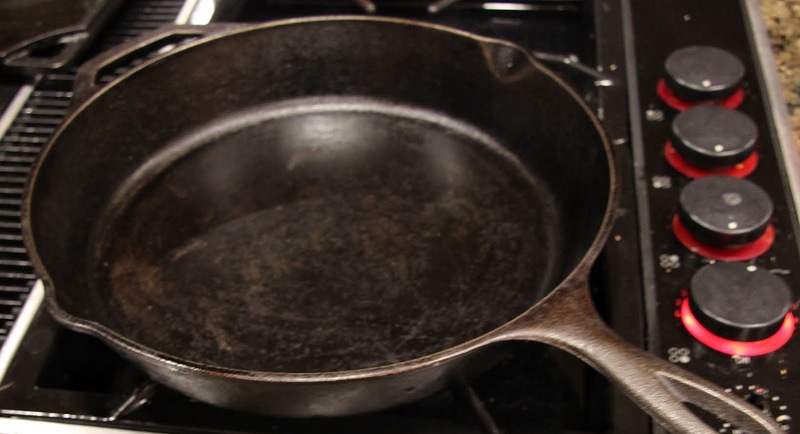 If you don’t have a cast iron pan, I strongly suggest you get one – its uses are plentiful. You could buy this Lodge 12in Skillet and these tongs, which you will also need, and it would still be cheaper than going out for a really nice dinner with your family of four. Just sayin’. Third, an instant-read thermometer will be your friend unless you are a seasoned steak chef who’s used to the finger test method. If you don’t already know it, I’m not going to try to explain it. Last, but certainly not least, let your steak rest for 5 – 10 minutes, covered with foil, before slicing into it or you will lose very valuable juices. 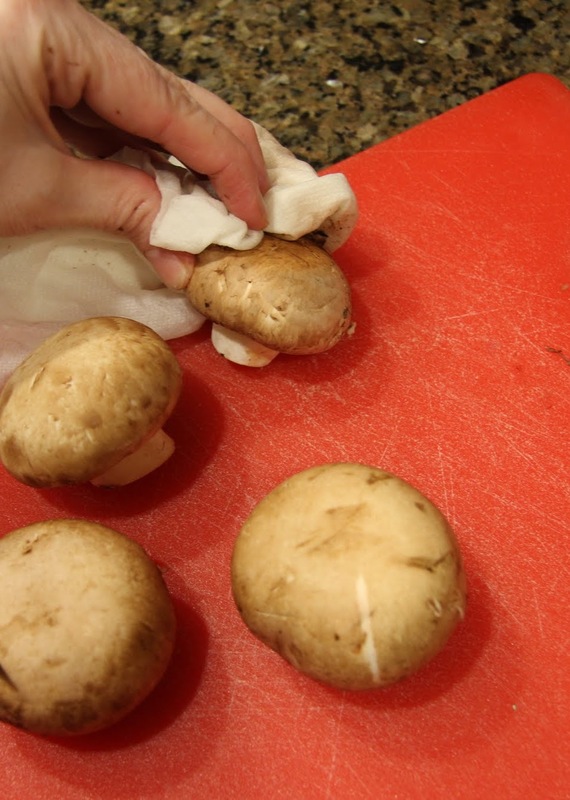 It will not get cold and it will buy you time to prepare your mushrooms. The New York has always been my favorite cut but I know many prefer an even more marbled/fatty ribeye steak or leaner but most tender filet mignon. 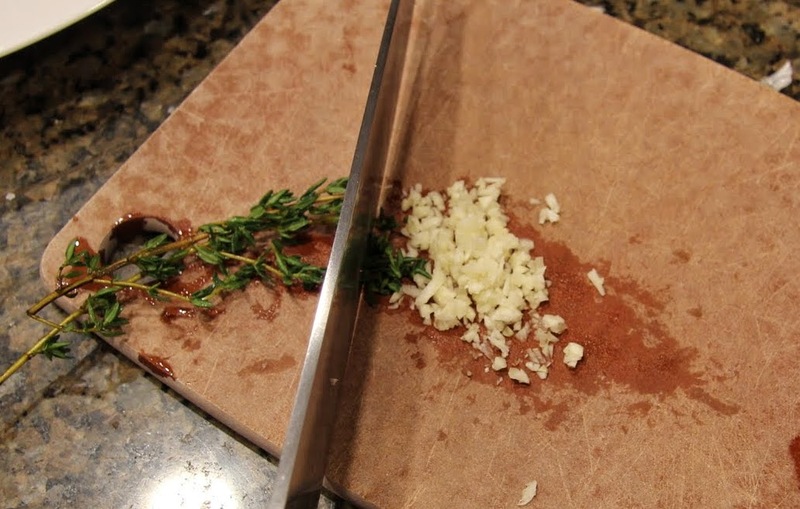 You can use the following cooking method for your favorite cut of steak. As always, please read through the recipe before beginning to make sure you have your timing right. Remove steaks from the refrigerator and place them on a large plate. 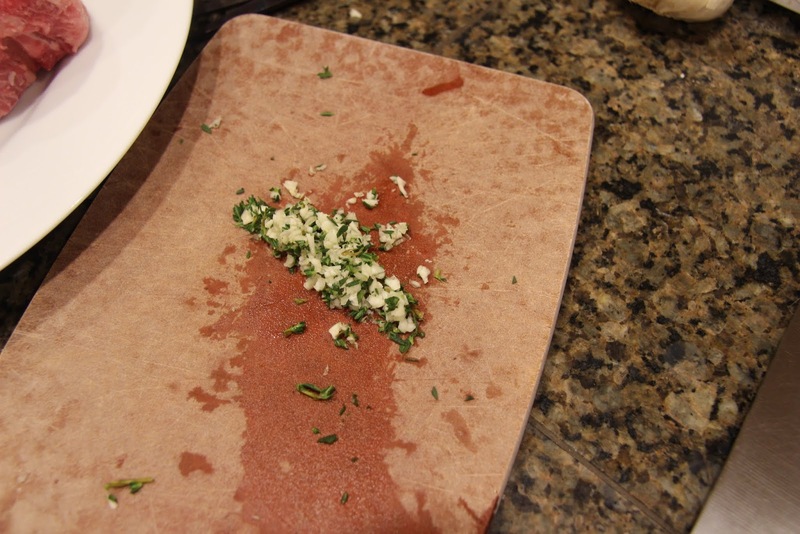 Sprinkle generously on both sides with kosher salt (or another coarse salt). 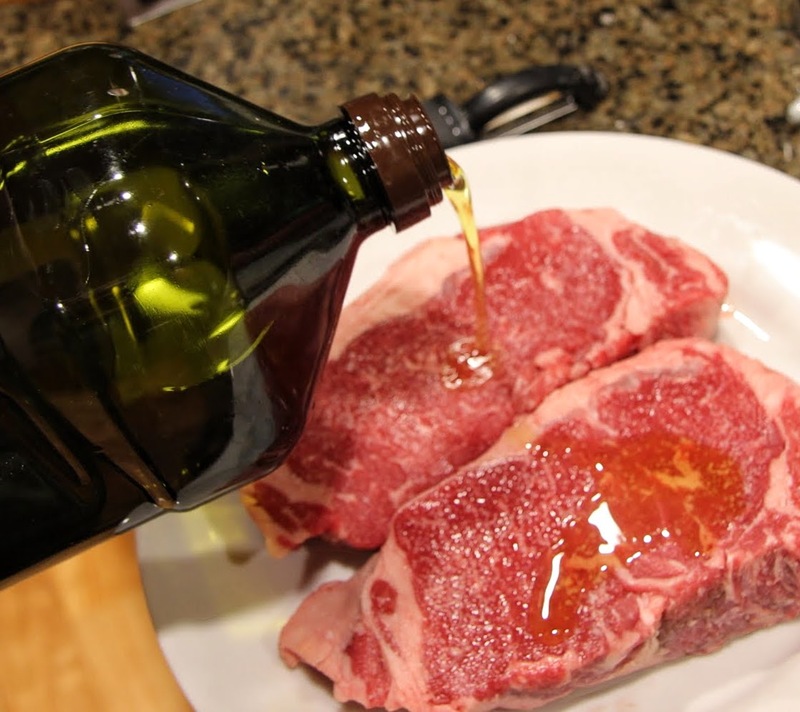 Drizzle olive oil, about 1 – 1 1/2 tablespoons, over the steaks, then rub the oil, garlic, and thyme onto both sides. 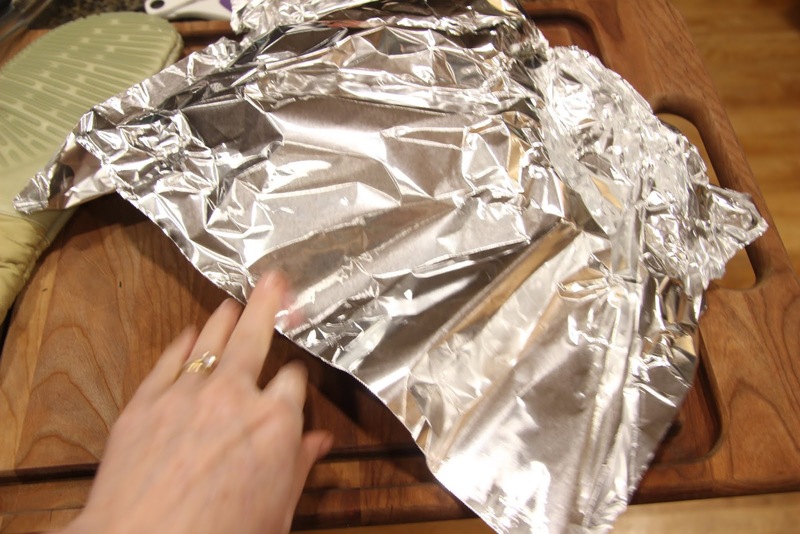 Allow the steaks to rest (cover with plastic wrap or foil) for 30 – 45 minutes depending on thickness. Meanwhile, clean and slice mushrooms and crumble blue cheese so they are ready to go. 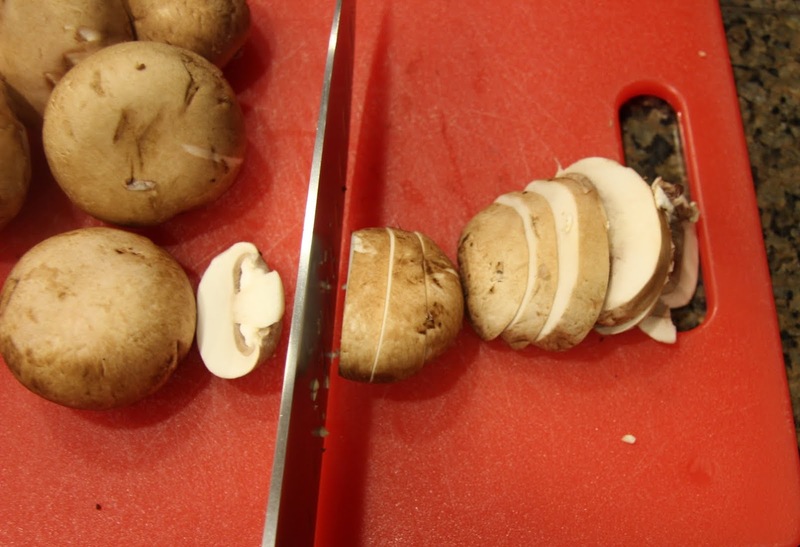 Be sure and slice off the tough end of the mushroom stem. Set aside. 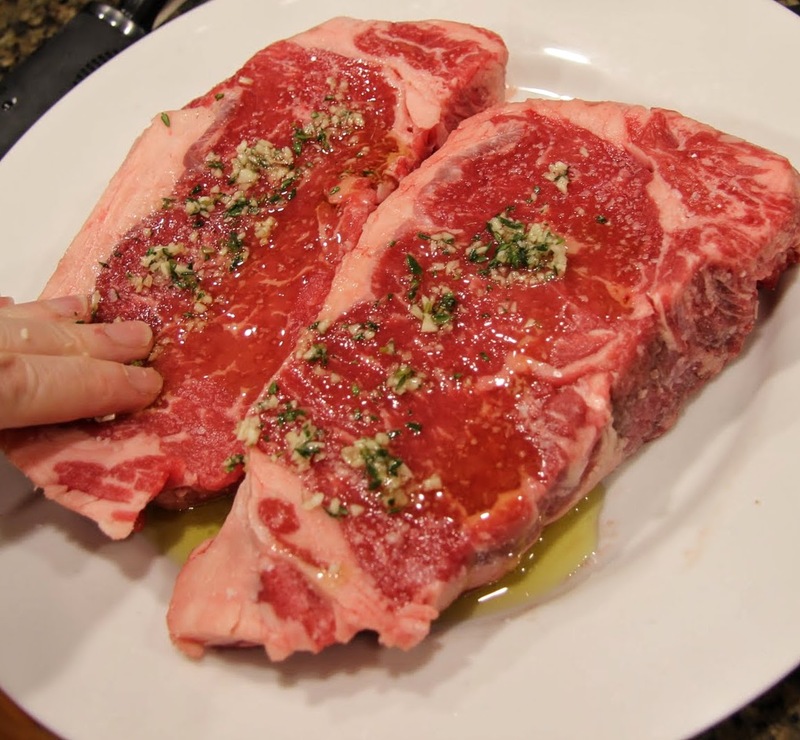 After your steaks have lost their chill, preheat oven to 400 degrees (convection) or 425 degrees (conventional). Mine was already preheated because I baked my potatoes first. You may or may not need to finish your steaks in the oven. I like to do it if I have very thick steaks but if they are only an inch or thinner it will not be necessary. 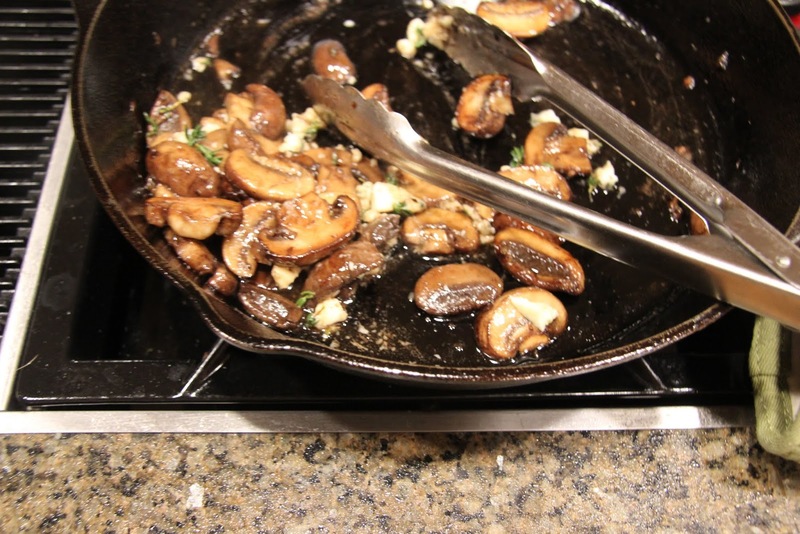 Preheat your cast iron pan on the stovetop on medium-high heat. 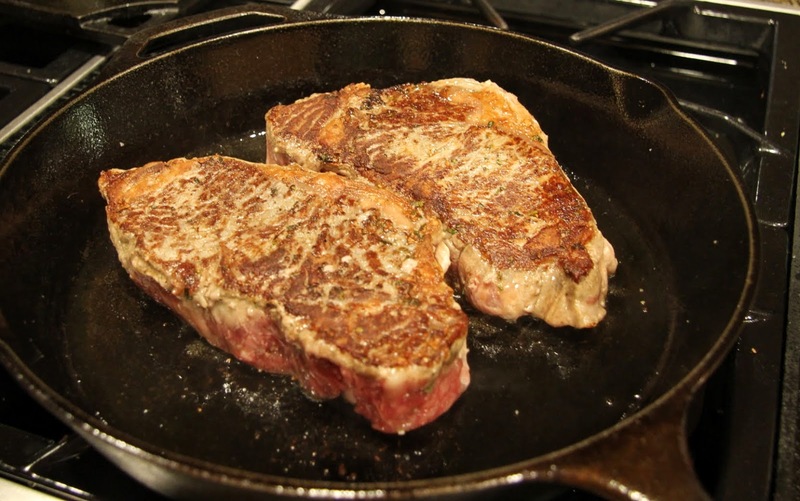 If you don’t have cast iron, make sure your pan is going to give the meat a good, caramelized sear; many nonstick pans will not work well for this purpose. 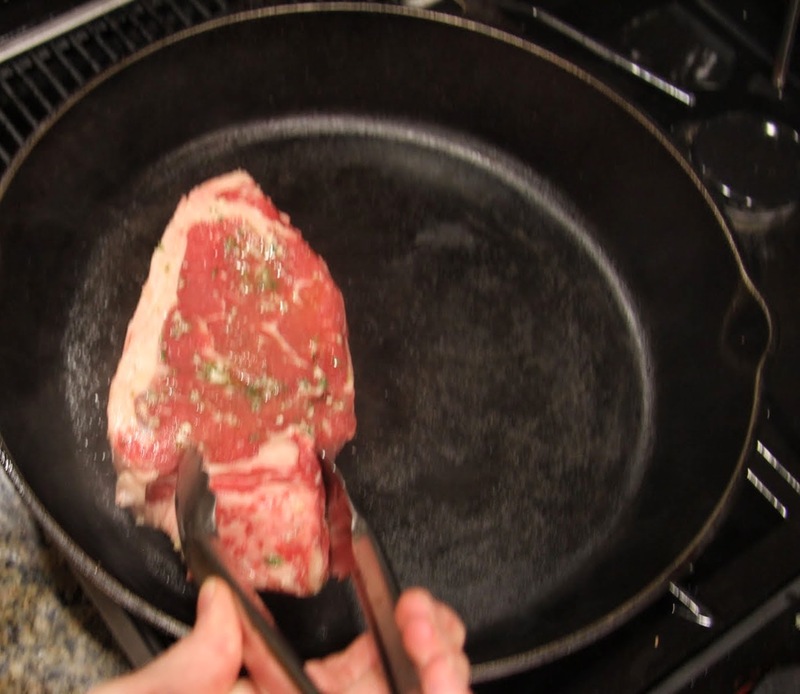 Once the pan is hot (a drop of water should sizzle and evaporate instantly), put in your steaks making sure not to crowd the pan. 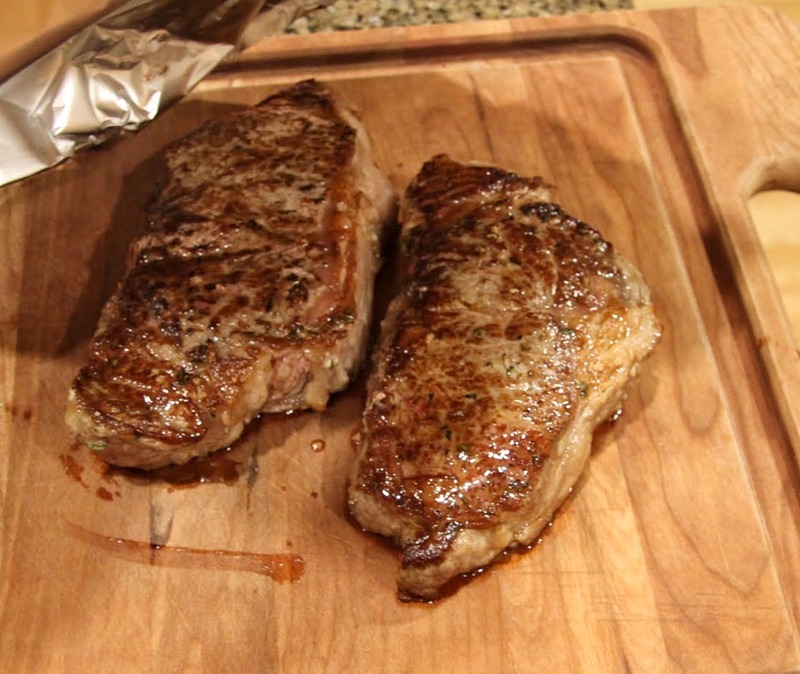 Allow them to cook 2 – 3 minutes on each side until you get a nice, caramelized sear. Transfer to the preheated oven or, depending on thickness, reduce the heat of the pan to medium and cook to desired doneness. Use this handy degree of doneness chart as a temperature guide. It took about 7 minutes for my 2-inch thick steaks to reach a temperature of 140 degrees which is somewhere between medium rare and medium. Always err on the side of undercooking because you can always stick it back in the oven or put it back in the pan for a couple minutes if it’s too rare when you slice into it. 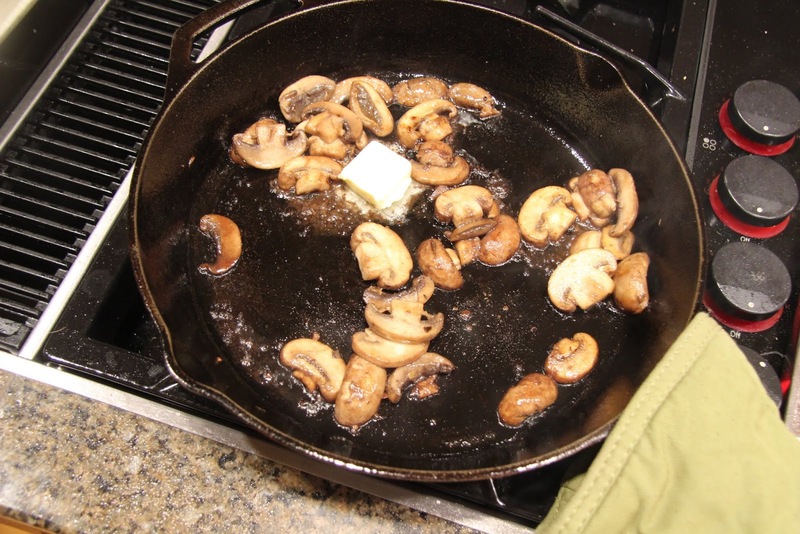 Remove the steaks from the pan and let them rest, covered with foil, while you prepare the mushrooms. 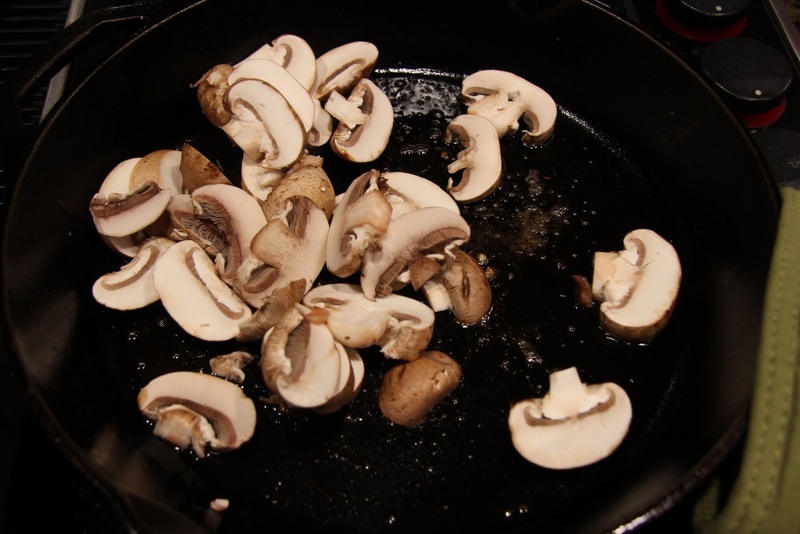 Cook, turning frequently with a spatula or tongs until the mushrooms begin to brown. 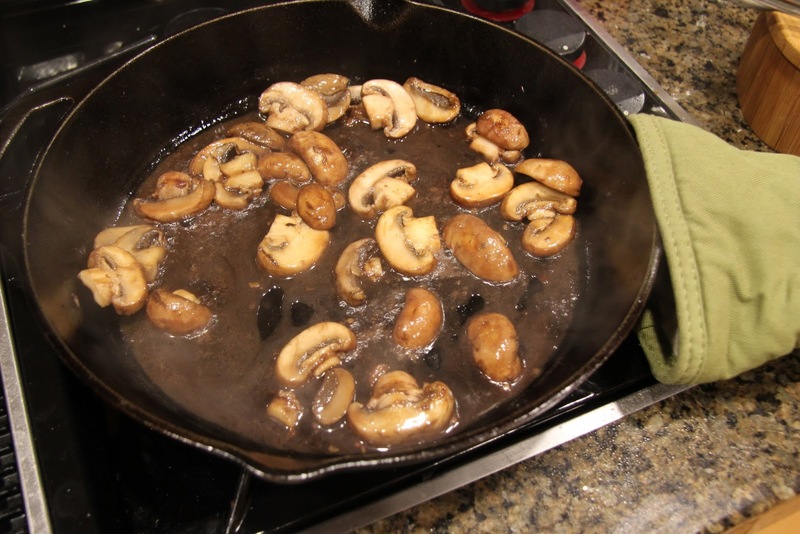 Once the mushrooms are mostly browned, add red wine to deglaze the pan, stirring to lift up all the brown bits left in the pan from the meat and cook, turning/stirring frequently on medium-high until the wine has reduced almost completely. Turn the heat off and add butter. Slice rested steak (not too thin) and plate it with sides. 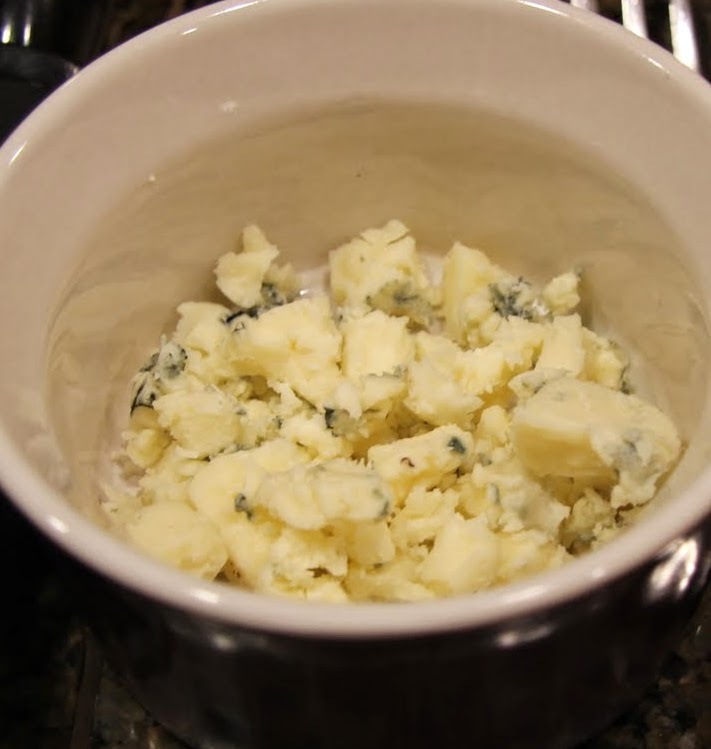 Quickly stir in blue cheese crumbles then top each portion of steak with the mushrooms. Finish with a little more salt and freshly ground pepper.